A full scale version of Rosemary Feit Covey's The 0 Project will be mounted for the MoveOn.org March this Saturday. 200 masks will be distributed and two full-sized banners will be a part of the march. What is the 0 Project you ask? The 0 Project is an interactive participatory political art project from the mind of Rosemary Feit Covey, involving both local and global participation. The project has wrapped buildings, been projected on walls, and acted as creative catalyst for dancers, poets, musicians, and social activists. The 0 Project expresses voicelessness but also the inverse, a howl of protest. The project is designed to demonstrate that when art acts as a catalyst and invites responses, the ensuing dialogue becomes a form of art in itself. The 0 Project is collaborative by nature and open to all who wish to participate. 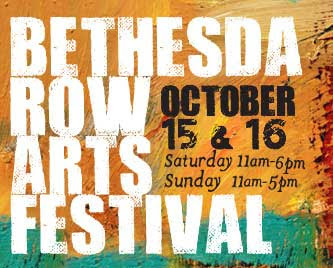 The 14th annual Bethesda Row Arts Festival will be held October 15th and 16th. This year the festival features the work of 185 leading fine artists and crafters from around the country. Media includes ceramics, drawings, fabrics, glass, graphics, jewelry, metalwork, paintings, pastels, photography, printmaking, sculpture, wood and 2D and 3D mixed media. The streets around Around 7200 Woodmont Ave. in Bethesda within walking distance of the Metro.